SMALL with Cushion and Medium/Standard Headgear - SHIPS FREE! MEDIUM with Cushion and Medium/Standard Headgear - SHIPS FREE! LARGE with Cushion and Medium/Standard Headgear - SHIPS FREE! 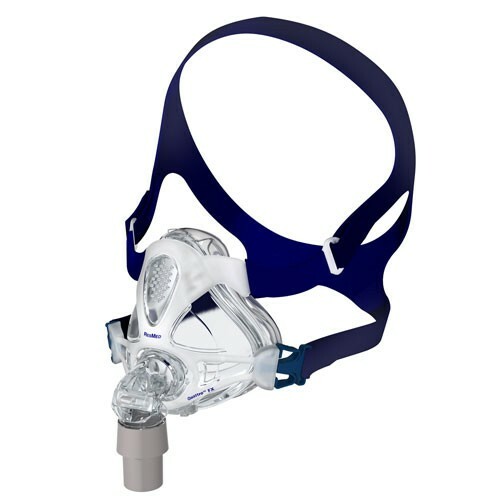 Quattro FX Full Face Mask is manufactured by one of the top CPAP therapy companies in the world, ResMed. The ResMed CPAP Full Face Mask provides an unobstructed view. The Quattro™ FX provides the coverage and stability of a traditional full face mask, but with a clear field of vision. Built with the quality and durability ResMed CPAP Masks are known for, the Quattro FX Full Face Mask is lightweight and compact for greater patient comfort. Sleep Apnea Therapy delivered by the Quattro FX is comfortable throughout the night. Full Face coverage with unobstructed views. Compact, lightweight and quiet means reduced patient anxiety. Fewer parts for greater simplicity and ease of use. All the coverage and stability of a full face mask with a clear field of vision and lightweight frame. Soft Spring Air™ cushion distributes pressure evenly and maintains seal as you move during sleep. Three Size Options: Small, Medium, Large. I have been a C-Pap/Bi-Pap user for the past 15 years and have tried almost all the full face masks available. At pressures such as mine (17) full face masks are the only way to go. With a C-Pap machine this probably would not be a great mask because of the constant pressure during inspiration and expiration. Having said that, it is a great mask when combined with a Bi-Pap machine that basically stops the pressure during the expiration phase. Consequently, this mask does not leak and what's REALLY NICE is the "clear" field of vision. It's nice to wake up and not see "cage", "wall", or "cell bar" between your eyes! Completely agree with first reviewer. Mask either leaks - sounding like a fag horn - or you have to put it on so tightly it causes welts on your face. Also, to avoid leaks, you need to sleep flat on your back with no pillow. This mask truly is not any good. I am new to the cpap and this is my 3rd attempt to get a nights sleep. I first was given a mask for the nose, then went to the cushion, and because I breath through my mouth at night, was given this mask a few days ago. I find it the most difficult mask yet. The HARD plastic, and thin cushions make it almost impossible to lay without having air leak. The only option is making it so tight you have inch deep marks on your face in the morning. I am tempted to go back to the pillows and wear a chinstrap. Which, while awkward, it wasn't half as bad as this mask. I am still looking for comfort and sleep! Since with severe sleep apnea, going without isn't an option, I pray that someone comes up with a comfortable gel mask. so this Grandma can get some sleep! Avoid this mask, unless you plan on sleeping on your back and don't move an inch during the night.